The recipients and their families celebrated at the Richard Smart Scholarship Pau Hana event last Friday at the Pukalani Stables. Richard Smart Scholarship recipients (l-r) George Subiono, Crystal Souza, Dalynne Livingston, and Jimi-Jean Kalaniopio will be attending UH Hilo in the fall. Missing from the photo are Micah Kamohoali‘i and Lauren Amsbary. 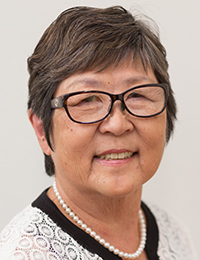 The Richard Smart Scholarship Fund awarded six scholarships this year and five of the recipients will be attending the University of Hawai‘i at Hilo this fall. 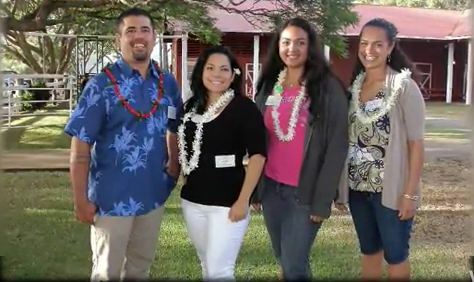 The scholarships are awarded to residents of Waimea on the Big Island whose parents are not college graduates. The scholarship is administered by the Hawai‘i Community Foundation. Representing UH Hilo at the event were Kenny Simmons, vice chancellor for academic affairs, and Leon Hallacher, chair of the natural sciences division. “This was a terrific event, great students, great families, wonderful stories about the generosity of Richard Smart,” said Simmons. The recipients are George Subiono, Crystal Souza, Dalynne Livingston, Jimi-Jean Kalaniopio and Micah Kamohoali‘i. George Subiono is a graduate of Honoka‘a High School and will be a junior majoring in kinisiology. He plans on becoming a health teacher. Crystal Souza graduated from Honoka‘a High School and will be a junior majoring in psychology. Daylynn Livingston graduated this year from Kanu ‘O Ka ‘Aina New Century Public Charter School. She plans to major in political science with a minor in business administration. Jimi-Jean Kalaniopio graduated from the Kapalama Campus of Kamehameha Schools. She’ll be a junior earning a bachelor’s degree in nursing. Micah Kamohoali‘i graduated from Honoka‘a High School and is currently pursuing a degree in Hawaiian studies and language.